Professor Abboud introduced the students to the teaching faculty and support staff before Dr Graham Arnold and Mr Sadiq Nasir gave them a whistle-stop tour of the TORT Centre and its teaching suites, the Institute of Motion Analysis and Research and its laboratory facilities and Ninewells Hospital and Medical School and Library. A buffet lunch was then laid on for students and staff to mingle and discuss their respective backgrounds, the facilities at the TORT Centre, the courses and any proposed ideas for research projects in an informal and relaxed manner. “It is always an exciting time welcoming our new arrivals. 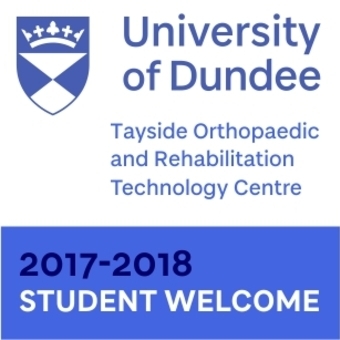 I would like to say a huge welcome to all our new students for 2017-2018. It is a great testament to the small dedicated team here at TORT that we can offer such wide-ranging and diverse research-based courses to nearly 50 in-house students when PhDs are included".